Hiking Rinjani package 5 days start at Senaru village to Senaru crater rim and overnight, at second day walk down to Segara Anak lake and overnight here for 2 nights, then hike up to Sembalun crater rim and overnight here and the last day climb up to summit of mount Rinjani then down to Sembalun village. This program suitable for beginner hiker. We will come to pick up you with air condition car at your arrival place or hotel within Lombok island then transfer to Senaru, meet with us and check in hotel provide in Senaru. If you have enough time we will guide you to walk waterfall and return to hotel. Wake up at 6:30am and get breakfast. 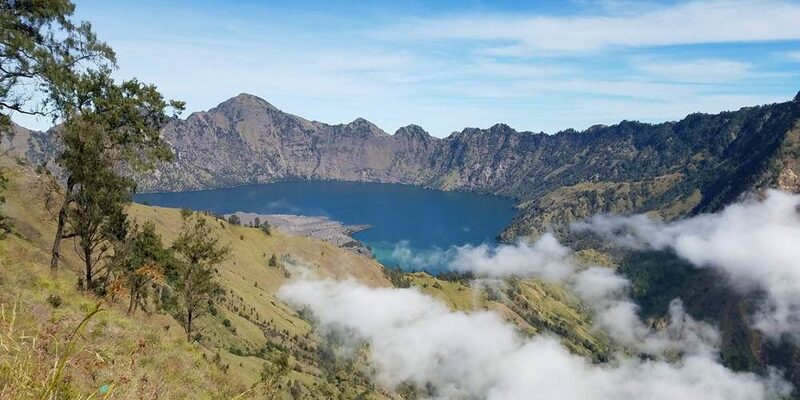 After that, we’ll drive to Rinjani Trek center Senaru for register. After that, we’ll descend back down to sembalun crater rim in 2 hours and have breakfast there. We’ll continue to descend to Post 2 sembalun, which takes 3 hours to reach, lunch, dinner, rest and overnight here. After breakfast we’ll continue back to Sembalun village, which takes 2 hours to reach. The car will take us to senaru village and transfer you to your next destination.